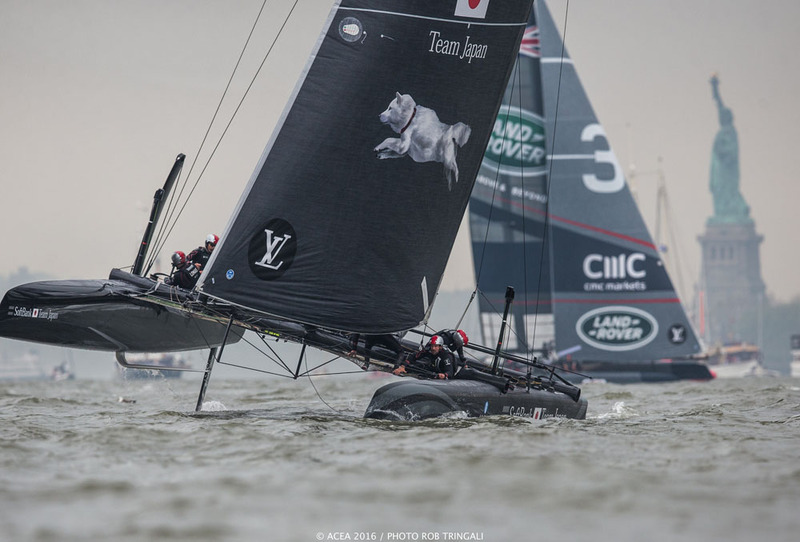 The six foiling catamarans competing in the Louis Vuitton America’s Cup World Series made quite a splash in New York. 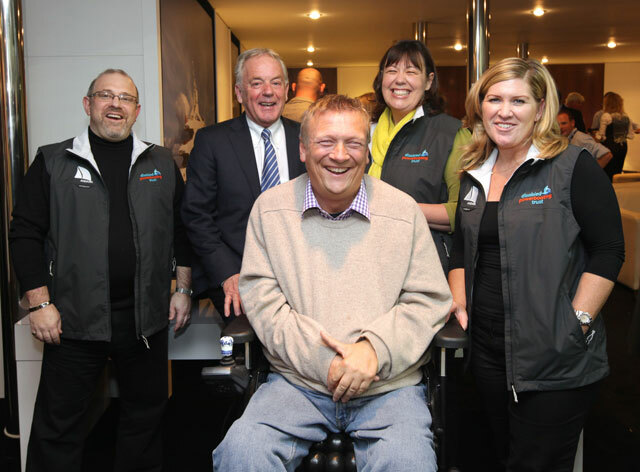 Diane Byrne reports. 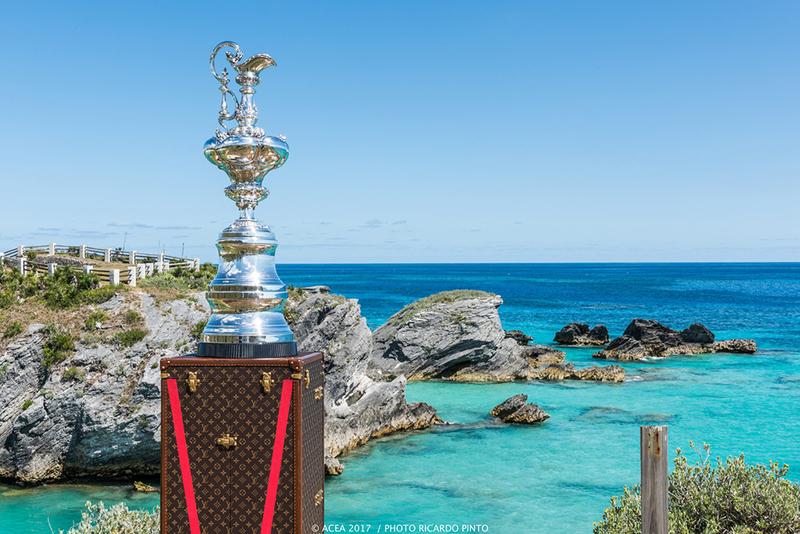 It's been 96 years since the America's Cup was last seen in the Big Apple, and there's no denying the grand return to New York of the oldest trophy in sport would have benefitted from better sailing conditions. 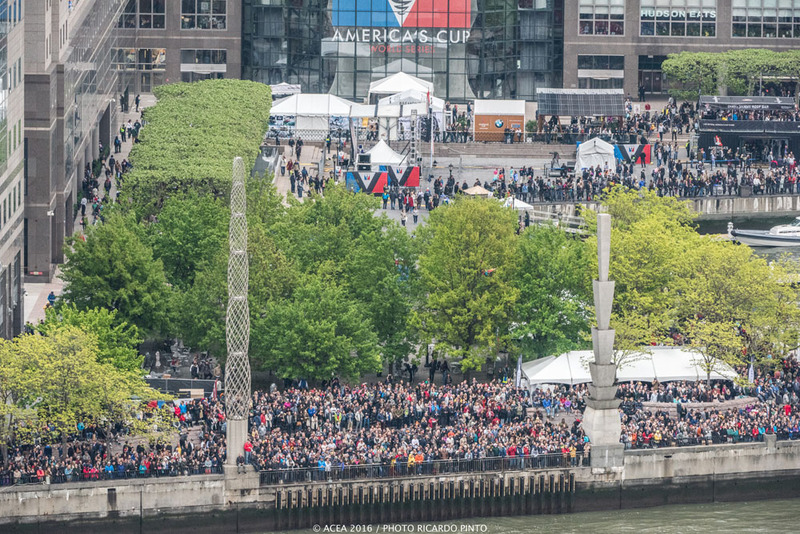 However, the crowds along both banks of the Hudson River were out in force to watch the six teams battle it out for the fifth event in the America's Cup World Series, with the overall event result decided by a flukey gust in the very last "New York" minute. 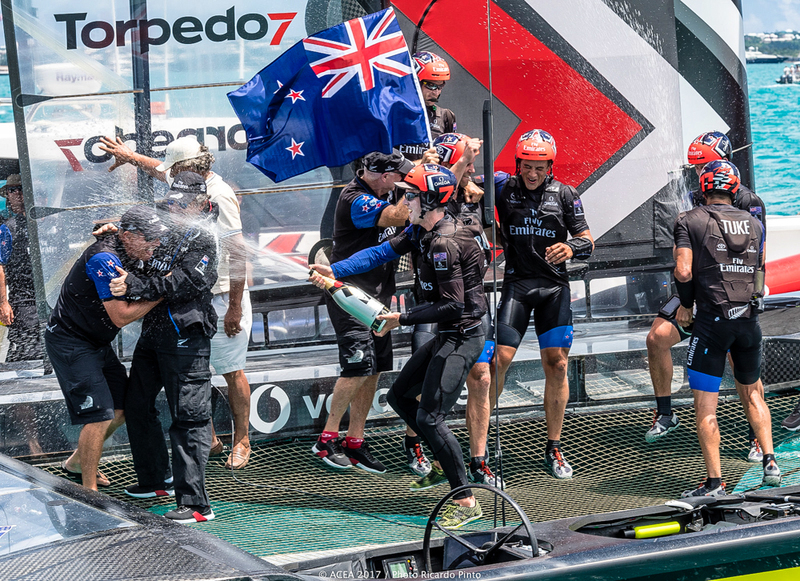 Emirates Team New Zealand came out on top again, riding their luck in the final race to capitalise on their consistent finishes in the previous two races (photo: Rob Tringali/ACEA). Gloomy skies notwithstanding on race day one, an estimated 75,000 people lined the shores of the Hudson River in lower Manhattan and on the New Jersey side. 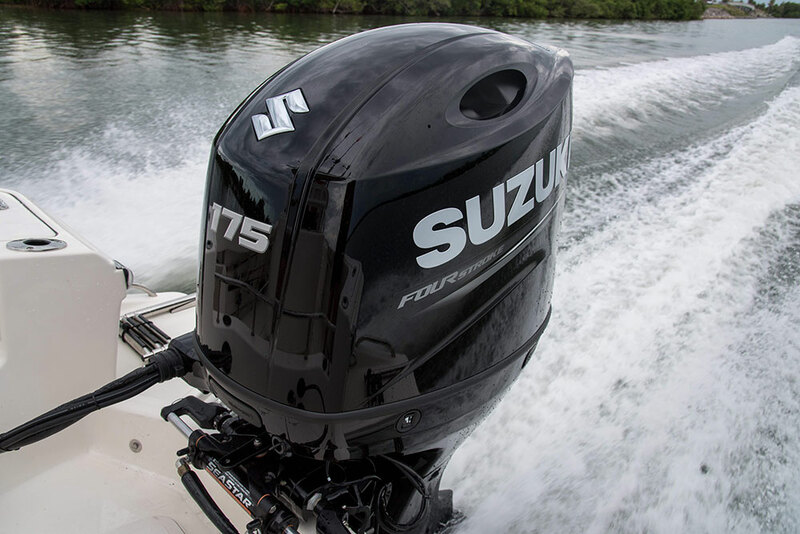 Despite their excitement, and the adrenalin flow of the six teams, Mother Nature had different plans. The forecast southerlies fizzled, and winds were so light that racing was delayed, then abandoned three times. 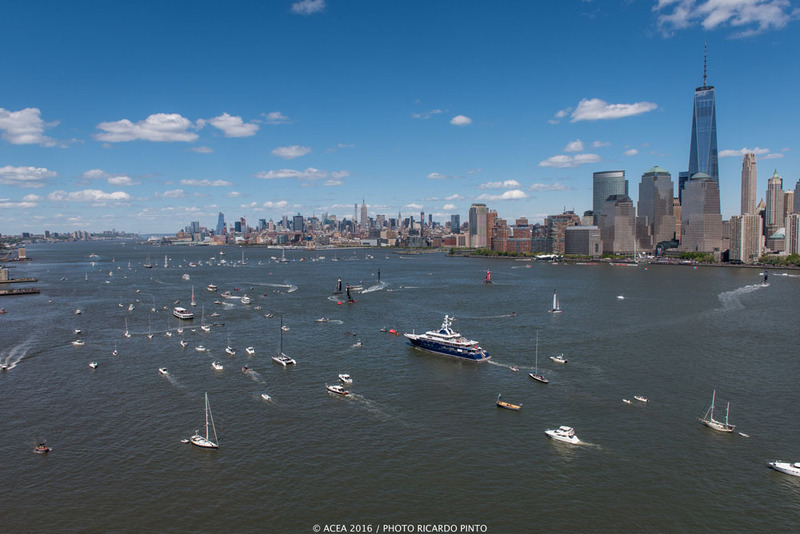 An estimated 75,000 spectators lined the banks of the Hudson River to watch the (lack of) racing on Day one (photo: Ricardo Pinto/ACEA). Four knots of wind finally materialised, enough to hold a short “substitute race” as race time was winding down. 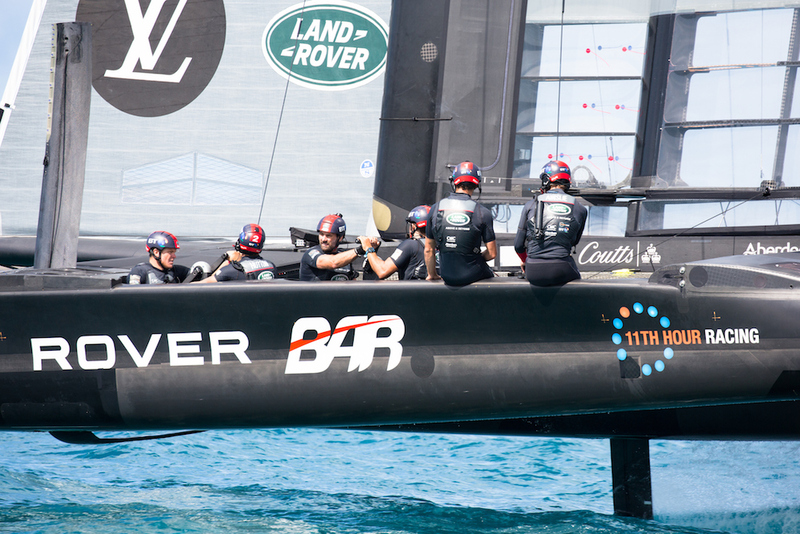 While the results would only count if Sunday’s races were scrapped, the foiling AC45 catamarans put on a show on a short course near to shore. The racing was close and tactical, the lead changed hands a few times, and SoftBank Team Japan crossed the finish line in front. Dean Barker's SoftBank Team Japan won the "substitute race" on day one, but the points would only have counted if day two had also been a washout (photo: Rob Tringali/ACEA). If the first day was “good,” race day two was “epic,” in Oracle Team USA skipper Jimmy Spithill’s words. An estimated 100,000 spectators took to the Hudson shoreline under sunny skies. Super Sunday, so-named for the double points awarded, featured dramatic wind shifts and velocities ranging from 5 to 20 knots. Throw in a roaring current, and it added up to lots of place changing. 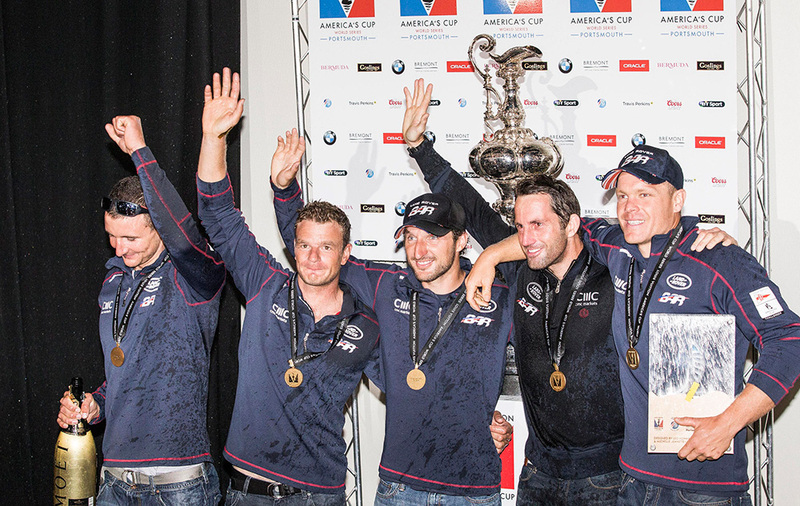 Artemis Racing won the opening, nine-leg race, while Groupama Team France finished ahead in the five-leg second race. The regatta was still anyone’s for the taking going into the final race, but it didn’t start out too well for Emirates Team New Zealand when they hooked the starting buoy’s anchor line and punctured their hull against the buoy. But then, on the next to last leg when the leading pack fell out of the wind, Team New Zealand picked up a good gust, jumped on her foils, and sailed around them, from fifth to first, to win the race and regatta. 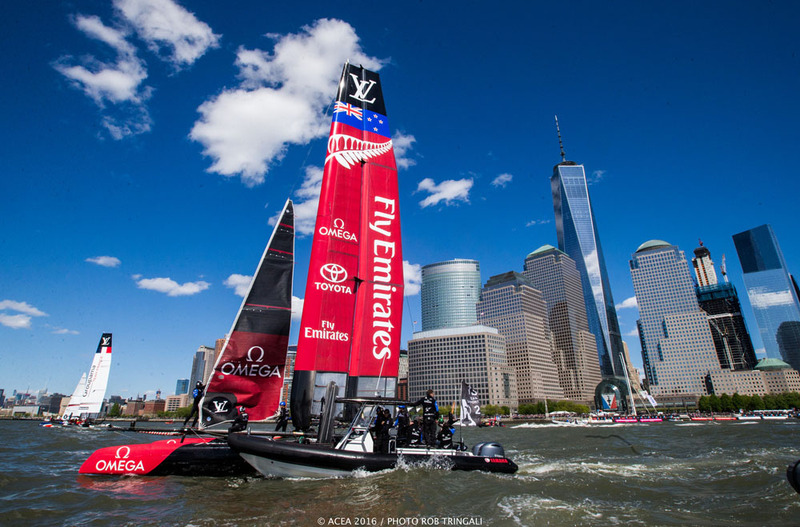 Oracle Team USA skipper, Jimmy Spithill described day two of the America's Cup New York as "epic" (photo: Diane Byrne). 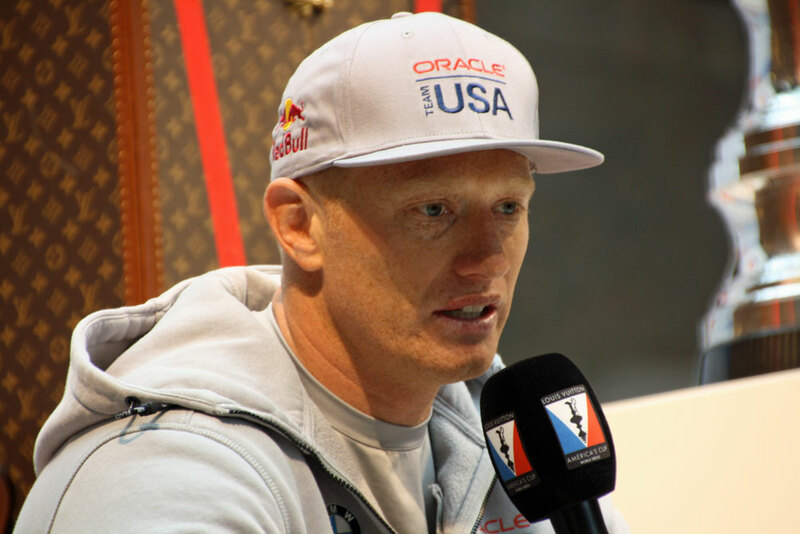 On race day one, Jimmy Spithill, Oracle Team USA’s skipper, commented, “This is the largest crowd I’ve ever seen at a Louis Vuitton America’s Cup World Series regatta, and I hope they come back tomorrow.” He got his wish, in spades – both onshore and on the water. The Louis Vuitton America’s Cup World Series shut down the Hudson from lower Manhattan to Midtown and across to the New Jersey side for several hours through the weekend. Olympic skiing champion Lyndsey Vonn joined Oracle Team USA for a blast in some great conditions on the Friday "demo day" (photo: Ricardo Pinto/ACEA). Of course, the best conditions were on the Friday – practice day, or "demo day" – which suited Olympic ski champion, Lindsey Vonn, who took a ride along with Oracle Team USA. Other famous names spotted in the crowd were: restaurateur and Food Network star Marcus Samuelsson, Sir Richard Branson and actor Liam Hemsworth. 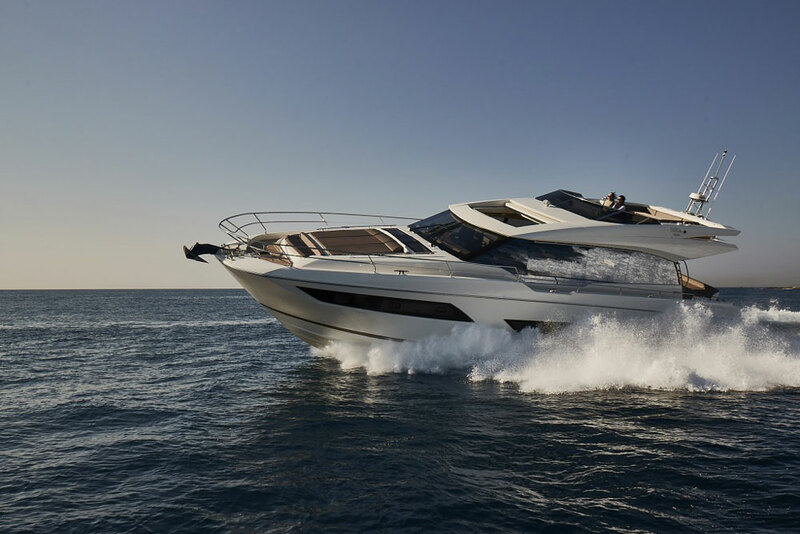 Then there were the famous yachts. 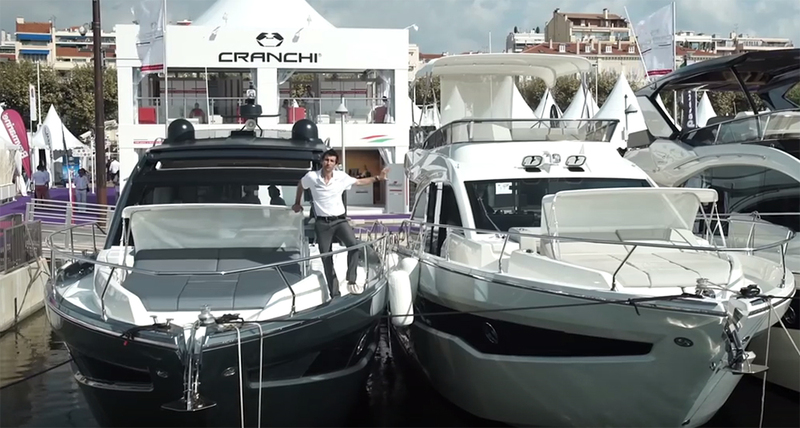 The J-Class beauties Ranger and Topaz plus the Lürssen-built megayacht Northern Star joined the throngs of spectator boats. 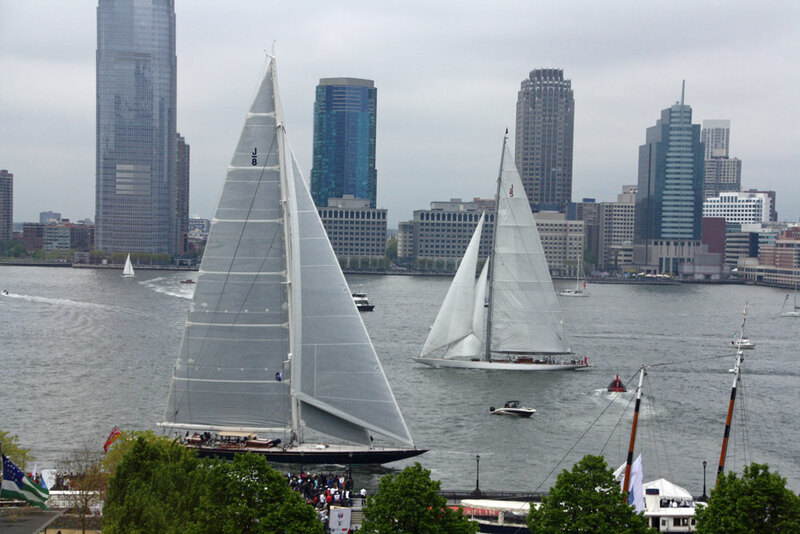 J Class yachts Topaz and Ranger were on hand to witness the racing in New York (photo: Diane Byrne). Northern Star heads the fleet of spectator boats on day two (photo: Ricardo Pinto/ACEA).